WASHINGTON -- The Federal Communications Commission has denied T-Mobile US' request for more airwaves to be set aside for smaller wireless companies like itself to bid on during a government auction next year. The unanimous vote Thursday by the five-member commission came after months of T-Mobile's lobbying for stricter limits for AT&T's and Verizon Communications' participation in the auction of prized low-frequency airwaves. The vote was something of a compromise among the FCC's Democrats, who wanted to give smaller carriers a leg up while ensuring that restrictions on the big carriers wouldn't cut the proceeds of the auction, expected to be the agency's largest. "Good news -- the reserve includes great quality spectrum & looks like the FCC will be monitoring closely so duopoly can't game the system," Legere tweeted, referring to the top two U.S. carriers, Verizon and AT&T. 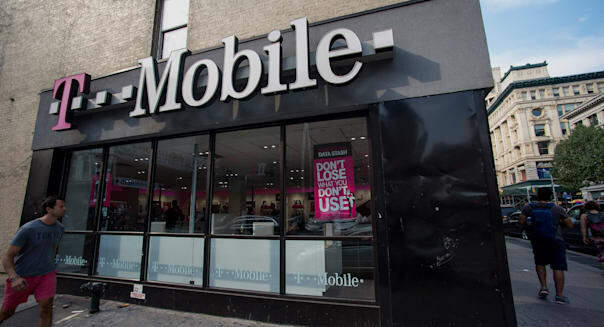 T-Mobile (TMUS) shares were down 1.2 percent at $40.24 in afternoon trading, while Verizon (VZ) slipped 0.6 percent and AT&T (T) fell 1.6 percent.